If it was a report card, the grade would be A+. Valdora Cyles PHX carbon time trial/triathlon bicycle frame has just earned the highest fatigue certification possible from the world's most respected independent testing laboratories, Germany's EFBe Pruftechnik. "We are not surprised with the results of the tests," says Peter Olson, President and CEO of Olson International, Inc, makers of Valdora frames. "We design and build our frames to ride great and to be fast and durable. The 'Top Performance' certification just underlines our company philosophy." Valdora bicycles, while geared toward the active cyclist and triathlete, are designed with all athletes in mind. Be they ex-baseball players, football players adding cycling to their training regiment, or even past athletes looking at triathlon as a new sport in which to rekindle their competitive juices. "The competitive spirit does not need to end after a high school, college, or professional athletic career," says Dave Watson, former collegiate swimmer and novice age group triathlete. "The sport of triathlon is growing dramatically." 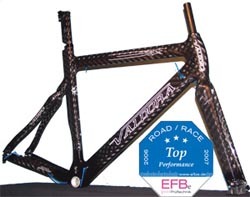 And Valdora Cycles is growing right along with it offering products like the "Top Performance" certified Valdora Cyles PHX carbon time trial/triathlon bicycle frame. Valdora Cycles are products of Olson International, Inc., a Scottsdale, Arizona-based corporation. The company has been involved in the cycling industry since 1996 as a designer, importer and manufacturing general contractor of bicycles, frames and accessories for domestic and international customers. For product information and investor relations, contact 1877TriBike@ValdoraCycles.com.Telephone: 1-877-Tri-Bike. Website: www.valdoracycles.com.